Editor's Note: It's been a while since we raved about a personal care product, but that time here now! "If there's one thing that I'm really drawn to with any beauty product, it's innovation. When I read that this new deodorant was based on the same odor molecule trapping technology as Febreze Fabric Refresher , I was intrigued, and knew I had to give it a try. 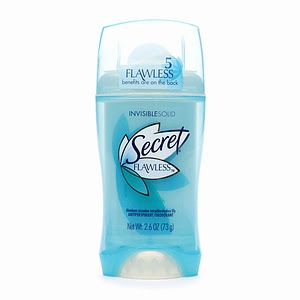 This deodorant is a gem of a product! It worked incredibly well to stop both odor and wetness. Better yet, I didn't experience any underarm irritation or itchiness. With just a few swipes either before I went to sleep or in the AM I was dry all day- with not a trace of odor. The texture was smooth, light and silky on my skin and it didn't leave any white residue on my clothes or skin. The fresh scent was pleasant, and while never overwhelming, since it has continuous scent tecnhnology, I would get a pleasant whiff throughout the day, which totally made me feel confident. On very busy days, business trips in hot climates or even during a gym workout I was as fresh as I was in the morning. I Love Love Love this! " S.D.